Designed specifically for use in difficult terrain, the Surgo Mountain Rescue Vehicle has capabilities far beyond that of any production SUV. The concept was created by Warsaw-based studio 2sympleks with input from real-life GOPR and TOPR rescuers. Its innovative suspension, developed by the neighboring Automotive Industry Institute, lets it lock its body in a shifted position, enables approach and departure angles of nearly 90 degrees, and has an advanced system of springs and shock absorbers. Inside are seats for up to eight rescuers, plus enough room for two victims to be safely transported via stretchers. While a scale model has been built, no plans to build a full-size version have been announced. Translating the brand's iconic design for an emission-free future, the Mini Electric Concept makes subtle yet important tweaks to the classic silhouette. Its grille retains its hexagonal shape but is closed off to improve aerodynamics, while the circular headlamp assemblies are filled with distinctive LED lamps. The brake lights see updates as well, with half the Union Jack visible as an LED dot matrix, and the 3D-printed inlays in the 19-inch wheels recall the fiberglass structure of the air deflectors while continuing the car's contrasting use of matte and glossy surfaces. While the company claims the car represents a "near-term vision," it's unlikely to see production in its current form. The original Maybach 6 gave us a glimpse at what Mercedes' ultra-luxury brand's flagship coupe could be. The Vision Mercedes-Maybach 6 Cabriolet does the same for a drop-top. It's powered by an electric drive system producing 750 hp with a range of over 200 miles. Similarly advanced is the interior, with a display strip that runs from the rear across the doors and all the way across the dash. Most striking, however, is the art deco-inspired exterior design, with its oversized hood and grill, yacht-like boat tail rear, 24-inch alloy wheels, and 20-foot length. Like its hard-topped sibling, it's unlikely to see production anytime soon. BMW's compact roadster has been out of production for over a year and hasn't seen a redesign since 2009. The new BMW Z4 Concept changes that. It diverts noticeably from the arguably feminine lines of its predecessors, replacing them with sharp edges that lend the car a wedge-like shape. It still holds the same long wheelbase, low-slung silhouette, and compact rear as classic roadsters, albeit accented with aggressive, vertical takes on the company's four-eyed headlights, a slanted kidney grille, and elongated L-shaped rear lights. Inside you'll find a driver-focused cabin with black surfaces denoting the cockpit, while the passenger area is clad in an orange that reflects the Energetic Orange frozen exterior paint. Unlike most concepts, this design study is set to appear in production-ready form sometime in the next year. It's not a "prototype" in the truest sense of the word — it's not a test run for a later production car. Instead, the Infiniti Prototype 9 Race Car is a one-off concept that reimagines a 1940s race car. While its steel body panels and steel ladder frame were built by hand using old-school manufacturing techniques, it's powered by an electric motor producing 148 hp. As a result, it can hit a top speed of over 100 mph and goes from 0-62 in just 5.5 seconds, but won't be of much use anywhere but the track, as its battery only lets it run for roughly 20 minutes at a time. For a firsthand glimpse, visit the 2017 Pebble Beach Concours d'Elegance. Traditionally, there hasn't been much difference between Lamborghini's concept cars and the production machines. The borderline-outrageous styling and performance filter down quite well from the drawing board to the pavement. The Concept S is just that — a concept — except that it's a fully-functional, street-legal car. Building on the Gallardo platform, Lamborghini created a convertible like no other. There is no canvas or retractable hardtop. The Concept S is a true roadster, with the occupants exposed to the elements. The striking twin-cockpit design separates the driver and passenger and reinforces the look of single seat racing cars of the past. A truly rare car, this one-off drivable concept is the ultimate spyder, with only 115 miles clocked in the last 11 years. 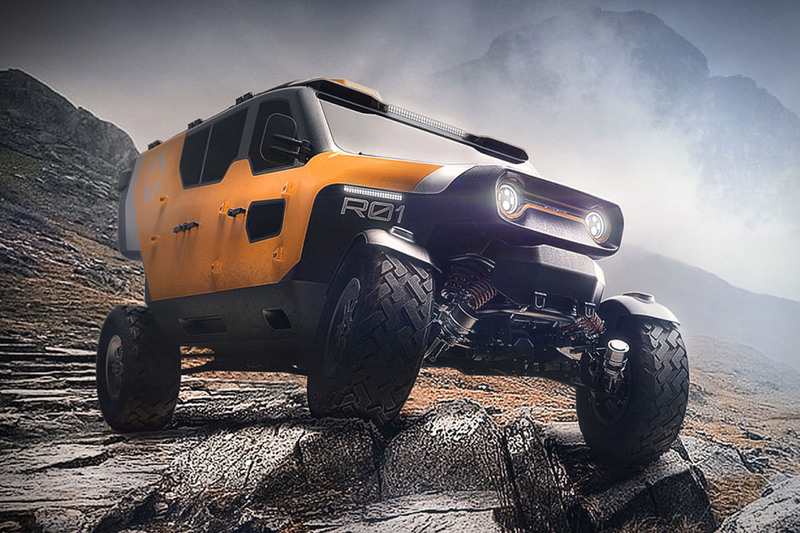 Rarely does nostalgia and futurism blend as well as they do in these Retro Futuristic Vehicles concepts from Brazilian designer Jomar Machado. Mixing familiar silhouettes — motorcycles, Mustangs, and Porsches among them — with parts both vintage and currently impossible, they provide a potential glimpse into the future of travel that's both fantastic and yet feels fully grounded.